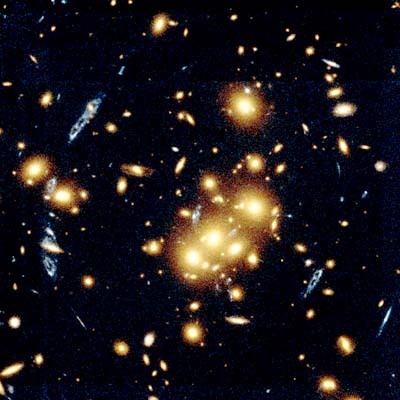 A recent New York Times article (John Noble Wilford, "The Universe as Telescope", 12/29/98) gave news of progress in the study of gravitational lensing. This phenomenon, predicted by Einstein, is caused by the deflection of light rays by massive objects. The article displayed this image. The bending of light rays may seem curious and even paradoxical to people who are used to thinking that light rays travel in straight lines. But what is actually happening is stranger still: a massive object deforms the nearby geometry of space, so that instead of flat it becomes curved. The light rays are still going as straight as they can, but in a curved region of space going as straight as you can may entail bending. We have an example right here on the surface of the Earth, where the straightest possible routes from one point to another lie along great circles. Besides the surface of the Earth, there are other familiar spaces which show intrinsic curvature: cones. A cone has a curvature singularity at its apex; in fact this feature makes it an appropriate first step in creating a simple geometrical analogue of the space distortion caused by a small, massive object. The pointiness of the cone is the analogue of the mass. The geometry of the cone, and its generalization to three-dimensional cones, manifest geometric lensing effects which can be worked out by hand and which give a reasonable first approximation to those produced by gravity. These images should be compared with those in Einstein Rings from Gravitational Lensing (by Peter Newbury of the University of British Columbia), which were produced by ray-tracing: following light paths in the metric given by the solution of Einstein's equations in the neighborhood of a spherically symmetric mass. The path of a light ray on the cone. Suppose in our two-dimensional paper-cone universe that the line of sight from an observer to a distant object passes close to the cone-point singularity. Slitting the cone along a line from the cone-point to the object in question shows that the object can be seen at each edge of the pie-minus-a-slice. The light rays appear to the observer as emanating from two objects, one on each side of the singularity. This doubling is the two-dimensional form of geometric lensing. The light rays from the two halves appear to the observer as emanating from two objects. The image consists of two regions in the observer's one-dimensional visual field. If the observer moves so as to destroy the alignment of observer, singularity and object one of the images eventually vanishes and the phenomenon evaporates. THREE-DIMENSIONAL CONES. A 3-dimensional cone is harder to think about because we can only see it ``from the outside" in four-dimensional space (just as the 2-dimensional cone can only be seen ``from the outside" in three dimensions). The fourth dimension here is an aid to maintaining the analogy with surface phenomena. In terms of our 3-dimensional universe it does not necessarily have any physical reality! Just as the paper cone has a circle as its base, the simplest 3-dimensional cone has a 2-dimensional spherical surface as its base. We will consider a ``right" cone in which each point of the surface is the same distance from the cone point. This figure represents the piece of the cone corresponding to a triangle on the spherical surface. The entire cone cannot be drawn this way. Suppose an observer in this world is standing at a point on the base sphere and looking at an object situated beyond the cone-point. We want to think of this operation as going on in many 2-dimensional cones at once, as follows. We may imagine that the sphere is marked with longitudes and latitudes and that the observer is at the North Pole. Then the observer is standing at the intersection of a family of great circles, those which run between the North Pole and the South. The space the observer is looking into is made up of the 2-dimensional cones based on those great circles. It turns out that a light ray joining two points in one of those cones must stay in that cone, so we can analyze what the observer sees cone by cone. In each cone the observer has a 1-dimensional field of vision, and the image in that field is constructed just as before. As we sweep through the family of meridian great circles, those one-dimensional fields sweep out the observer's (two-dimensional) field of vision, and the composite of those 1-dimensional images is the complete image seen by the observer. GEOMETRIC LENSING IN A THREE-DIMENSIONAL CONE. If the object is centered on the cone line through the South Pole, then for each great circle there will be two linear images, equidistant from the image of the singularity, and these will combine to form a halo about the singularity in the observer's visual field. An object centered on the cone line antipodal to the observer appears as a symmetrical halo about the image of the cone point. As the object is displaced to the right the halo becomes unsymmetrical and disassociates into two separate images. As the object moves away from the cone line through the South Pole, the halo will will disassociate into two separate images. If the motion continues, one of these images will disappear "behind the singularity," just as in the 2-dimensional case. For a large selection of web resources on general relativity, see Relativity on the Web, a page maintained by Chris Hillman of the University of Washington. © copyright 1999, American Mathematical Society.